Well, I’ve finished 30 blocks for my scrappy trip quilt, and officially run out of floor space in the room in which I sew. Ooops. I’m going for either 7×8 or 8×8 blocks, so I’ve got either 26 or 34 more blocks to go. It’s still fun! I discovered last weekend that I can strip piece perfectly competently while watching White Collar, if I set my laptop up on my sewing table where I can see it. This is either fantastic or completely terrible for my non-quilting productivity: we’ll see. I haven’t touched my other WiPs in a while: the semester is getting into gear, and the scrappy trip quilt is the one that’s out, so it’s what is getting worked on. 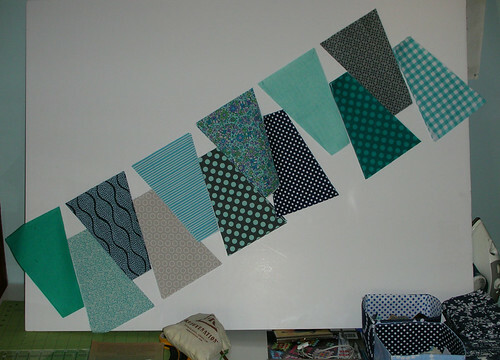 This means that my New Wave quilt tumblers are still just hanging out on a foamcore board: I’m trying to figure out the arrangement of the stripes, and it’s taking me a while to make up my mind. Any opinions? I’d love to hear what you think about how to re-arrange them: I’m not happy with them right now. 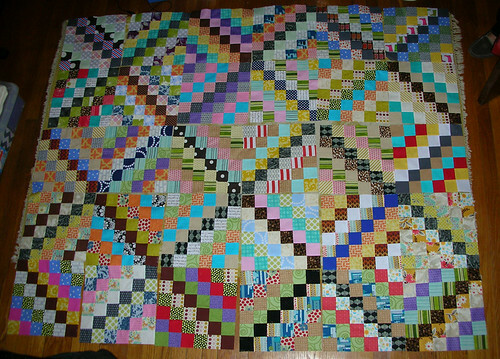 As for other projects on my quarterly finish to-do list, I haven’t started cutting for the Pinwheels and Postage Stamps quilt yet, because I feel like I already have enough WiPs out without adding more, and I really don’t have space to lay out the pieces of it without having to move them every time I wanted to work on something. The City Quilter is having a 20% off sale on Thursday and Friday! You can bet I’m planning on going over. Oooh, your scrappy trip is going to be big! I love it!! Looks great! I’m being seriously tempted by all the examples of this pattern I’m seeing around blogland!